The white flowering Cistus is in a narrow garden bordering the water race, by Duck Lawn. This shrub has large white flowers with maroon blotches. The leaves are quite bright green. 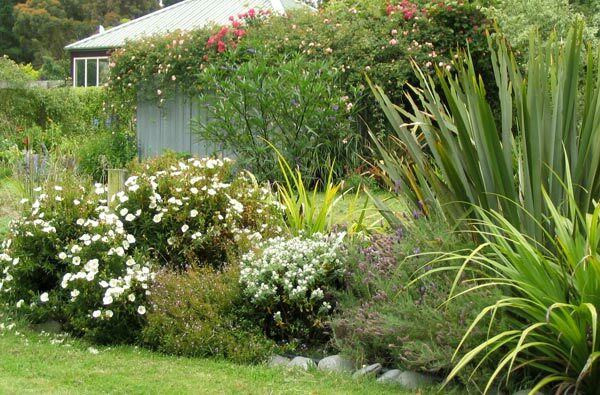 The white Cistus is next to a shiny green-leafed Astelia. These two plants (both rescued from the bargain bin at the local nursery) look great together - perfect easy-care shrubs for this part of my garden. 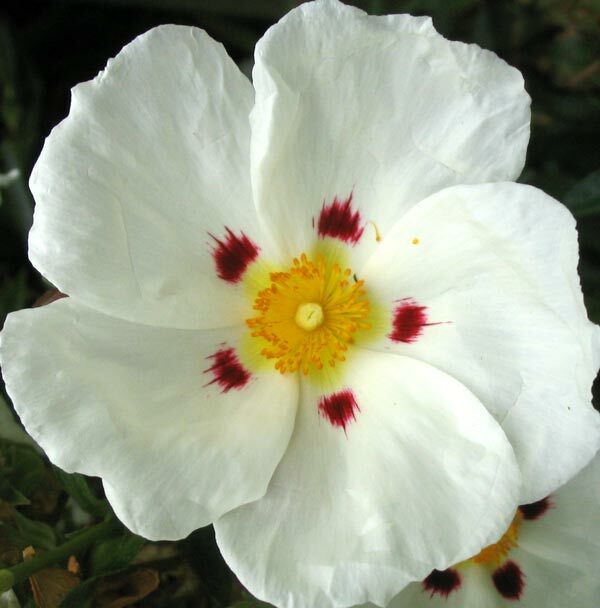 My books often mention Cistus as shrubs well worthy of nurturing. They are adaptable and long-flowering, and don't grow too straggly. 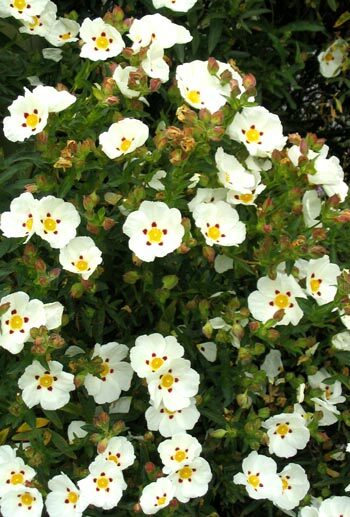 From the photographs the white flowering Cistus looks like Cistus ladanifer. My book of shrubs goes on to mention various cultivars - it's bound to be one of these. The other Cistus I grow has small soft pink flowers which bloom in late spring, and slightly grey-green foliage. It has a pretty texture even after flowering. I grow this pink Cistus by the Pond archway, where the pink flowering roses and the pink-toned hybrid flax make great companions. I've bought these shrubs knowing they were short-lived, but I've also been sometimes guilty of accelerating their death - oops! Cistus are also called Rock Roses - I'm not sure I know why. They are generous in flower.